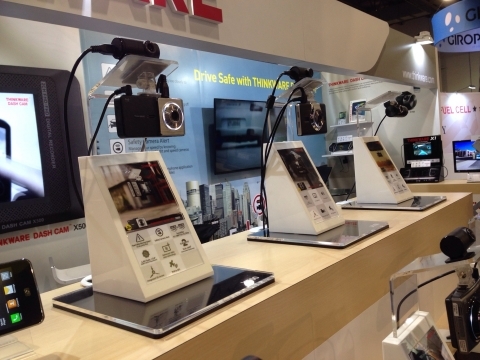 THINKWARE exhibited 10 dash cam models including THINKWARE DASH CAM F770 and THINKWARE DASH CAM X550 featuring Super Night Vision and Time Lapse at the CES 2016. SEOUL, KOREA--(Korea Newswire) January 06, 2016 -- THINKWARE (CEO: HEUNG BOK LEE, www.thinkware.com) (KOSDAQ:084730) will unveil world-class dash cam technologies at the CES 2016, January 6-9, 2016 in Las Vegas. This year the 5th participated THINKWARE will exhibit 10 dash cam models including THINKWARE DASH CAM F770 and THINKWARE DASH CAM X550 featuring ‘Super Night Vision’, a night image correction feature, and ‘Time Lapse’ that dramatically extends the parked recording hours. The ‘Super Night Vision’, which is optimized for dark parking environment, delivers up to 10 times higher brightness than existing products, featuring a new image signal processing (ISP) technology and real-time video processing function. The ‘Time Lapse,’ embracing improved video storage method, can record the details of the parked vehicle by extending the recording hours by up to 16 times compared to regular parking mode. The THINKWARE DASH CAM that adopted the ‘Advanced Driving Assistance System (ADAS)’ assures driver’s safety and convenience with features of the ‘Lane Departure Warning System (LDWS)’ that alerts drivers when swerving out of lane, the ‘Front Vehicle Departure Warning (FVDW)’ that informs driver when vehicle ahead is moving off and the ‘Front Collision Warning System (FCWS)’ that tells timing of manipulating break by calculating speed of the driver’s vehicle and that of the front vehicle in real time. THINKWARE DASH CAM products are available at 1,600 online and offline stores of Best Buy, Sam’s Club, and Amazon in the United States. THINKWARE is accelerating presence in world market by increasing supply of its products in a dozen countries, including the United Kingdom, Australia and Singapore. Please visit the THINKWARE booth (Sands, Booth #71166) at the CES 2016. Additional information can be found on THINKWARE website at www.thinkware.com. THINKWARE Corporation is the leading provider of location-based services and Innovative Smart Car IT since 1997, gaining strong foothold in Korea to be the preferred choice of local consumers. THINKWARE continues to advance and provide smart platform services ranging from car navigation and dash cam. Today, we are a global IT total service provider, bringing our know-how to over 800 cities worldwide such as London, New York, Sydney, Toronto and Singapore. Putting our customers first, THINKWARE is committed to improving lives everywhere by bringing to you comfort and convenience through Life Innovation. For more information, visit the company’s website at www.thinkware.com.